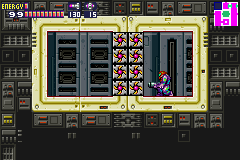 Screw Attack Blocks are a type of barrier found in Metroid: Zero Mission and Metroid Fusion that require the use of the Screw Attack to break through. While not ordinarily visible, Samus can expose them by dropping a Bomb next to one or by detonating a Power Bomb. Screw Attack Blocks: Use the Screw Attack to break these blocks apart.